One of the biggest heroes during the Mandalay Massacre was former Marine Taylor Winston, 29. He commandeered a pickup truck to rush the wounded to the hospital. He would drop a load off and go back for more. There was blood all over the vehicle. A dealership in Gilbert, Arizona thought that Winston’s heroic actions deserved recognition and they gifted him a brand new Ford F-150 truck. Taylor said he would sell his current vehicle and all the proceeds would go to help those impacted by the Vegas tragedy. He served two tours of duty… once a hero, always a hero. Ambulances had not arrived on the scene yet and Taylor knew that his actions could mean the difference between life and death for the victims of the shooting at the Route 91 Festival. 58 people were killed and 489 were wounded that night. I would imagine some people are still alive because of Taylor’s quick thinking and actions. Winston related what he saw and felt that night and the urgency of getting people to the hospital. “It was still quite scary, but we just knew they (the victims) had to get to the hospital immediately,” Winston said. “No ambulances were immediately available. There was far too many casualties for anyone to handle.” He appeared on CBS This Morning and said he started looking for a truck with the keys in it so he could make an improvised ambulance. “First one we tried opening had keys sitting right there. I started looking for people to take to the hospital,” said Winston. In the end, he would take three loads of wounded passengers to Desert Springs Hospital Medical Center before ambulances arrived. “There was just too many, and it was overwhelming how much blood was everywhere,” he said. The owner of the vehicle that Winston took was Phelps Amelsberg. 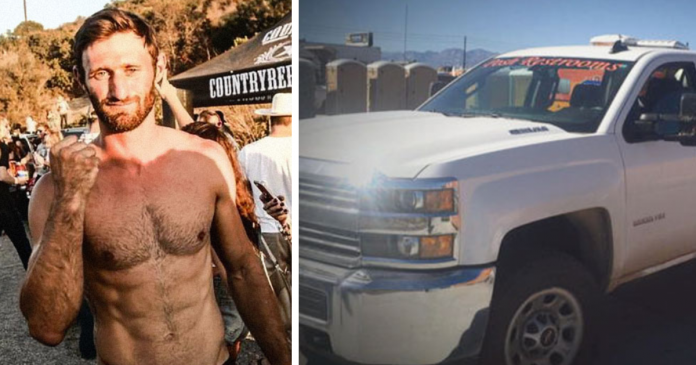 He just had one tiny request that he posted on Facebook: “To the person who stole my truck from Route 91 to haul a friend to the hospital: I am not mad. Would do the same thing if I had to,” Amelsberg wrote. “I would just like my keys back, please. I don’t even care that the back seats ruined. You ditched the truck at town square in front of Stoney, will even buy you dinner and give you your cowboy hat back,” he continued. The two men finally set a meeting up. Amelsberg would get his keys back and find out how the injured passengers were. “I have em for ya. When do you want to meet for em?” Winston replied. “I took about 30 critically injured to the hospital. Your truck was extremely important saving those people’s lives. I don’t know if they all made it. I saved the tool box too. We pulled it out to fit more people but put it back in after the 3rd trip,” Winston said. Several auto detailing businesses have volunteered to clean up the bloodstains in the back seat for free. These men and many other people helped save lives that night. Las Vegans owe them a debt and can’t thank them enough. Heroes rose during the worst mass shooting in US history and their stories are truly inspiring.